When I was a child my mother and her sisters were great story tellers regaling us with wonderful stories about our ancestors. I knew then that they were mainly fairy tales but nevertheless I enjoyed listening to their yarns. When the troubles broke in in the late 60s, things at home in the Creggan Estate had changed and gone were the wonderful yarns, to be replaced by debates about the latest incident and what the future held for us. I was in my early teens when the troubles broke out and found life was changing dramatically but, being a young man, I found the situation exciting. This rekindled our interest in Irish history and past campaigns and why they failed. It was around this time I became aware of my mother’s “uncle Edmund” but no information was forth coming other than my grandfather Daniel and Edmund were in the Free State army. My grandfather had resigned but there was something about Edmund that was better left unsaid. As time passed, many friends and neighbours were killed or spent many years in prison, but time did pass and the fire in my belly was no longer burning as it did in my youth and perhaps marriage and children can do that to youth and that sense of invincibility. 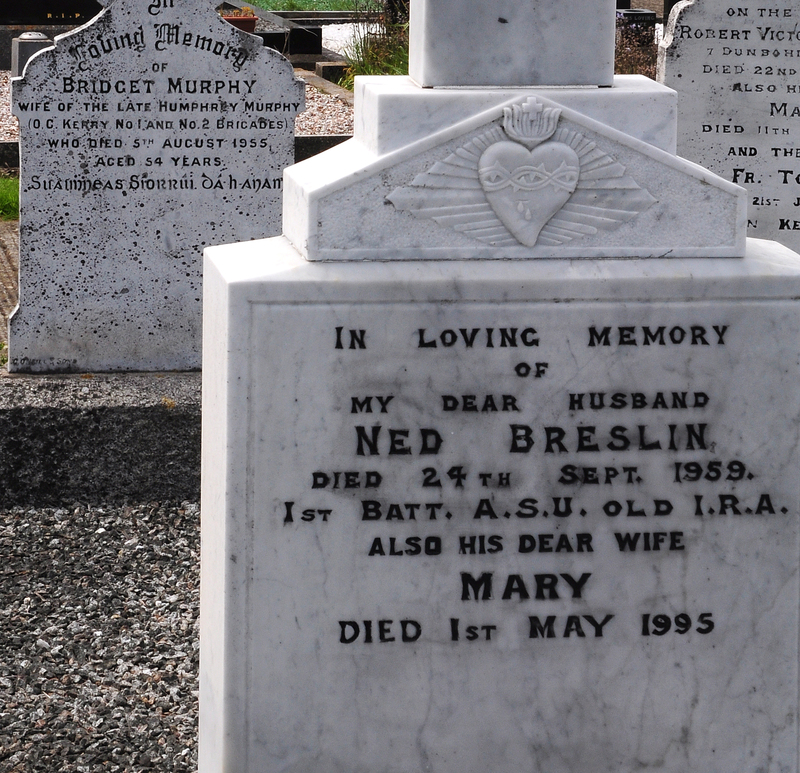 About 5 years ago I started to research my family tree and, after doing my father’s side of the family, commenced my mother’s side – the Breslins. A visit to my uncle Daniel and his information about uncle Edmund blew me away. He was the first to let me know that he was known in Dublin as “Ned” Breslin and started me on a journey of discovery about this fascinating man and the life he led. I made many trips to Dublin and London in order to find out all I could about Ned. Here is what I have discovered about Ned Breslin, my grand-uncle. How he got to Dublin is still a mystery as to date, despite two visits to the military archives, I have been unable to view his pension file. According to Colonel J V Joyce in his witness statement, Ned was made a full time member of the Dublin ASU in December 1920. 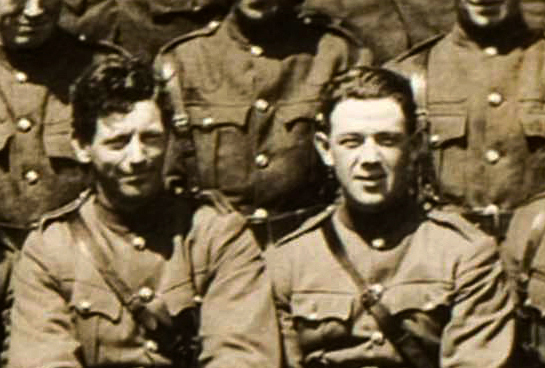 He took part in all operations as a member of the Dublin ASU (source t-Óglach magazine May 1922). He saved the lives of two of his comrades during an operation near the Phoenix Park. According to Christopher Fitzsimmons himself, Tom Flood and Ned were out to engage the enemy when an open touring car with four Auxiliaries approached from behind them. As soon as the car passed, Tom Flood, whose brother had been executed around this time, reached for his gun. Ned grabbed him and steered him into a pub in Queen St. Ned realised quickly that the first car was a decoy and another armoured car came from the same direction. The three men survived and went on to fight the good fight. Tom Flood and Ned remained lifelong friends and Tom was later best man at his wedding. According to Joe Leonard, Ned was also brought into the Squad from an early stage to support their operations. In his papers, he makes the following claim. “The Tipperary Volunteers (Breen, Treacy, Robinson and Hogan) returned to their area on or about 20 Feb 1920. The unit consisted of O’Daly, Leonard, Barrett, Doyle, Keogh, Slattery, Byrne, Bolster, Eddie Byrne, Ben Byrne, Reilly, Kennedy, Hanlon and Ned Breslin. His role in the squad was also confirmed in Vinny Byrne’s papers. Ned took part and was captured at the Custom House. Ned’s role has been well documented as he was arrested by the Auxiliaries as they claimed he had a bullet in the lining of his jacket. I was aware from an old grand-aunt that Ned was tortured at the hands of the Auxies. He had a few nails badly damaged on his hands. In the Mountjoy arrest entry sheet, his height was shown as 5-foot. Ned was about 5 ft 6. It is believed that he was brought to Mountjoy on a stretcher and his height was estimated from a lying position. He and the other men were tried by court marital by a British officer named Brigadier F S Montague-Bates. Ned’s wife claimed, as others have, that the men were sentenced to death but were saved by the signing of the treaty. I have been unable to confirm this but will continue to research. Ned was part of the first Dublin Guards who took over Beggers Bush after the treaty in Feb 1922. In May 1922, he was promoted to Commandant in an ever expanding Free State Army. Posted to Kerry under the command of Paddy O’Daly, he was part of the group of Dublin Guards who were involved in the killings at Ballyseedy. It is with great sadness and a heavy heart that I accept his role on that dreadful night. He has been singled out I feel unfairly as being the man responsible for what happened that night. I have read the court of enquiry papers and I was surprised as to how many were involved but are never mentioned. The RTE documentary was mainly responsible for highlighting his role that night but as always it contained inaccuracies. The documentary claims that “O’Daly, Breslin, Clark and Flood were requested to resign from the Irish Army”. This statement is not true and is taken out of context. I will refer to it with the Mutiny. The night of 6 March, Ned lost close comrades as a result of the booby trap mine at Knocknagoshel. Ballyseedy happened the following night – an act of revenge no doubt. Was one act any more justifiable than the other? While serving in Kerry, Ned met the love of his life Mary Slattery. Mary was from a republican family who on the main took the treaty side. She had a brother Thomas who was shot dead 10 Feb 1923 while serving with the Free State army. Mary was very active in Kerry during the war of independence and took part in many operations. 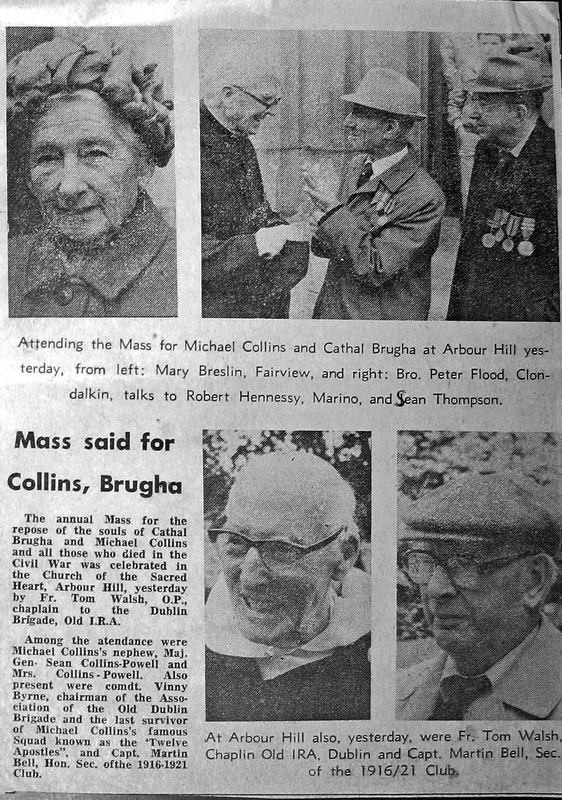 She attended the Michael Collins commemoration and mass for many years when her and Ned moved to Dublin. A wonderful photo of their wedding in Kerry, kindly given to be by a member of the Flood family, shows Tom Flood standing at the top of the steps as they are leaving the hotel. 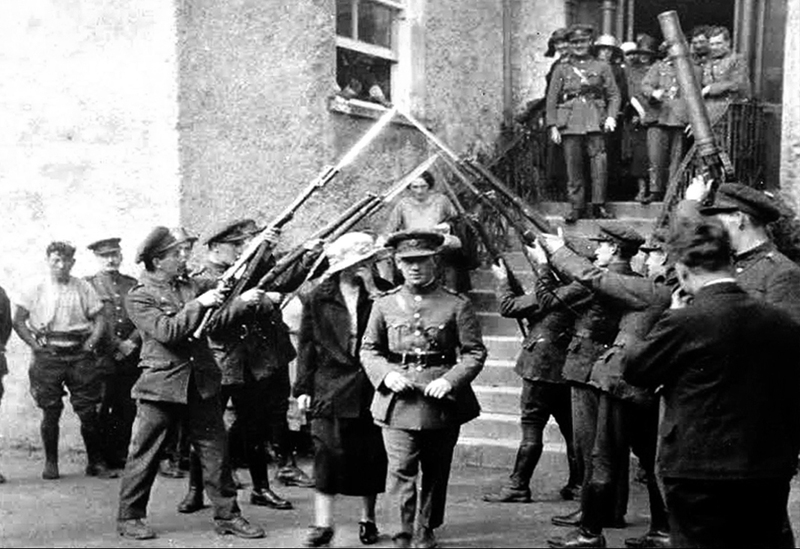 Ned returned to Dublin and remained in the Free State army until the Army Mutiny of March 1924. The Mutiny was led by Major-General Liam Tobin. Their aims were outlined in a document presented to the new Free State government, however no agreement was reached which lead to mass resignations including three Major-generals, seven Colonels and numerous Commandants, including Ned Breslin. I have a document which shows that Military Intelligence were keeping a close eye on the mutineers. Ned was re-commissioned back into the Army during the Emergency as an officer. He died September 1959 and is buried with Mary at Balgriffin Cemetery. I am extremely proud of my grand uncle Ned. I was amazed when this photo was taken of their grave as to who was buried directly behind them – Bridget Murphy wife of Humphrey Murphy, O/C Kerry Brigade! Hello Vincent, Thank you for taking the time to read the post & making a comment. Early on in the post Gerry talks about his family background. After several years of research, I am sure it took him a long time to decide on what would be his final view of Ned. O`Daly is not the subject of the post, but O`Daly was held in esteem by his men, thats fact not opinion. There was a huge amount of people involved in Ballyseedy, just as there was in Knocknagoshel.Most are unknown & will remain unknown. It would have been an easy root for Gerry to take leaving Ballyseedy out, but he wrote what I think was a good honest article on Ned Breslin. I think we are the first to put something online about his whole life. There will be many more stories coming to light here, all will have a Custom House Connection (well the burning anyway). Again thanks for the feedback & we look forward to more feedback from you in the future.